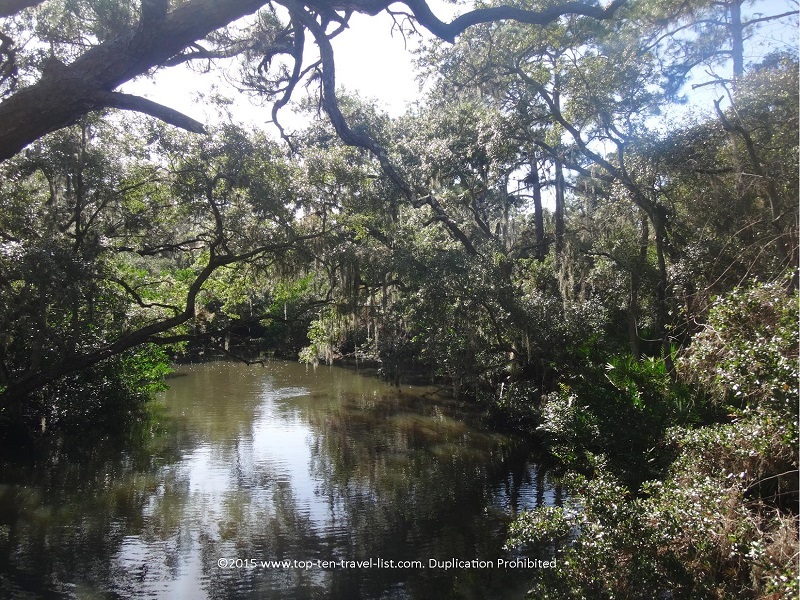 Oscar Scherer State Park: A Relaxing Break on Florida's Southwest Coast - Top Ten Travel Blog | Our experiences traveling throughout the US. 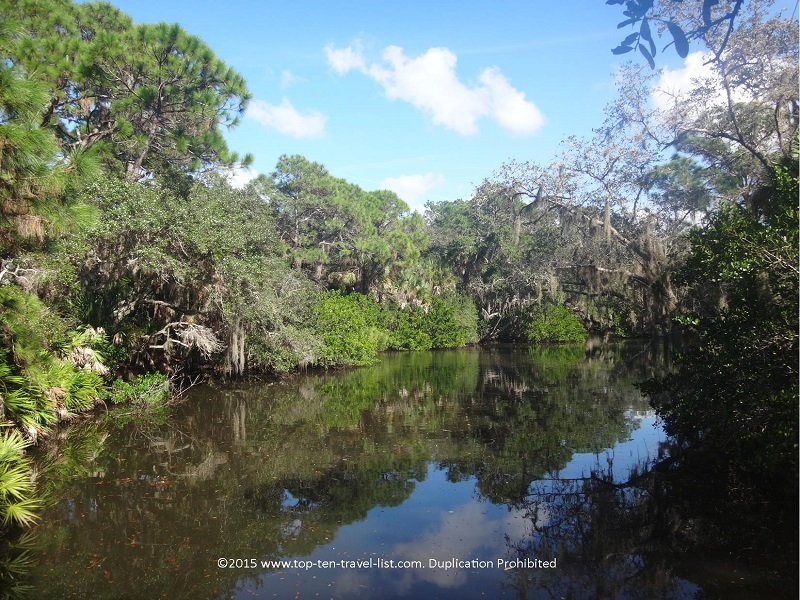 Oscar Sherer State Park is a great choice for visitors to the Sarasota and Venice areas who are seeking something a bit different than beaches, cruises, and tourist attractions. 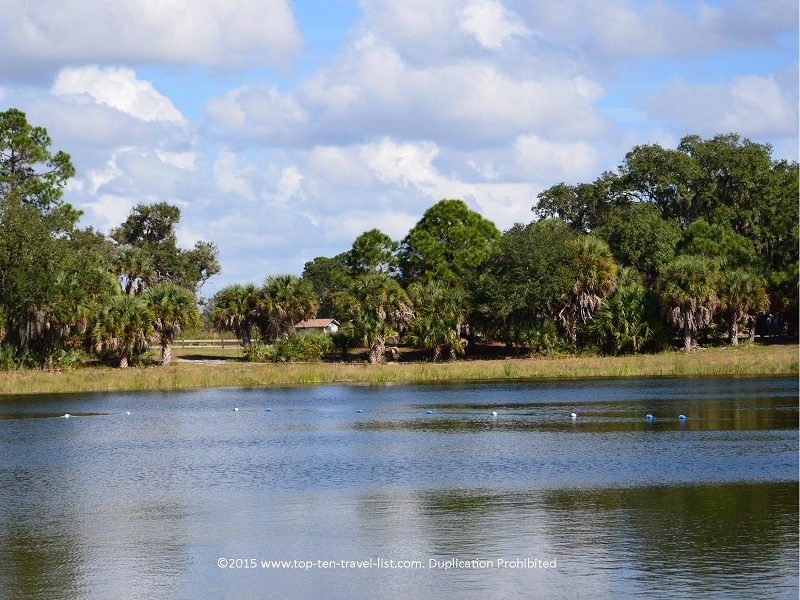 If you are looking for a bit of peace and quiet, head straight over to Oscar Sherer State Park in Ospry, located halfway between Sarasota and Venice. This quiet refuge offers you an opportunity to get in a bit of exercise, while exploring the native plants and wildlife found in this region of the state. Both hiking and cycling are available on the park’s 15 miles of trails. 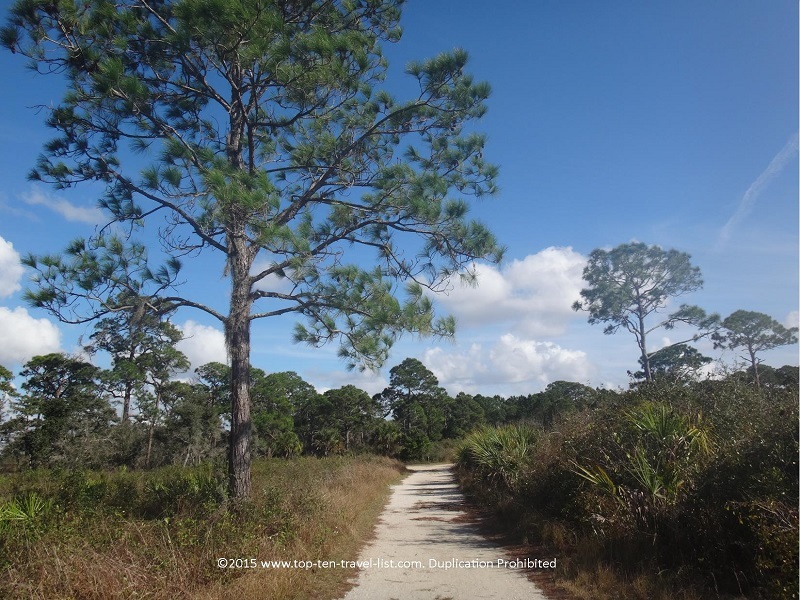 Most of the trails are pretty shady, a must for the hot, sunny climate of Southern Florida. Pick up a trail map at the entrance. The detailed guide will help you decide which trails suit your interest. Trails are well-marked, flat, and pretty easy. As you can see in the pictures below, you will encounter a variety of interesting landscapes as you make your way through the trails. Your chance of seeing wildlife will depend on the time of day and season. The park is most well known for its’ population of Florida Scrub Jays. 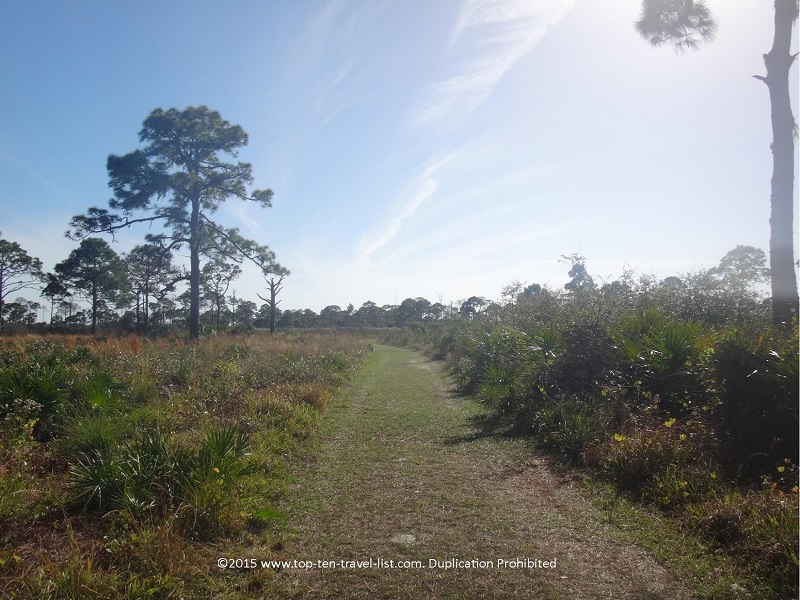 In addition, you may come across the following wildlife: alligators, gopher tortoises, bobcats, deer, and bald eagles. Some animals like the bobcat are nocturnal and and prefer to stay alone, so your chances of seeing them will be slim. On the other hand, gopher tortoises, although endangered, are pretty commonly seen at Florida parks. 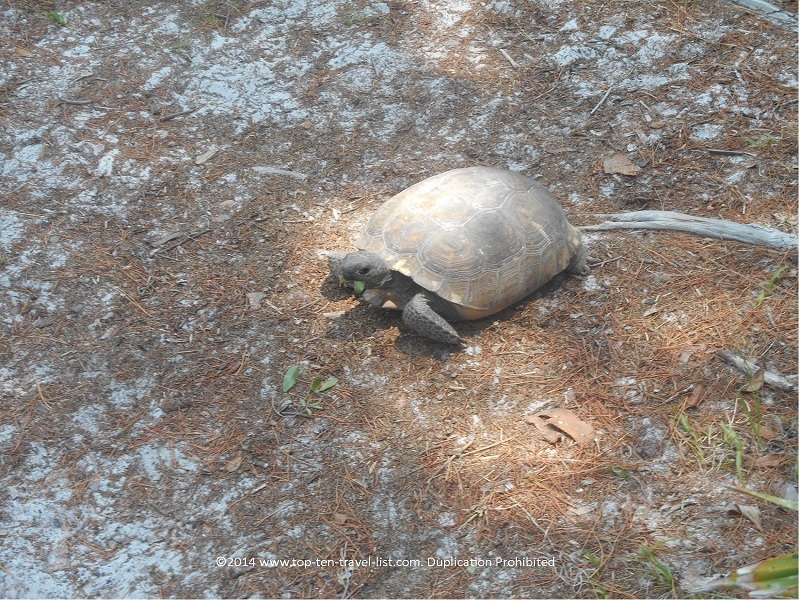 Be on the lookout for Gopher Tortoises! Overall, morning visits offer the best chance for seeing wildlife as there are less crowds and the temperatures are cooler. The trail map will tell you which forms of wildlife are more common on which trails. One of the best ways to explore all that the park has to offer is by kayaking or canoeing through South Creek. Bring your own or rent one at the Ranger Station. Newbies may want to check out one of the guided tours, offered every Wednesday. 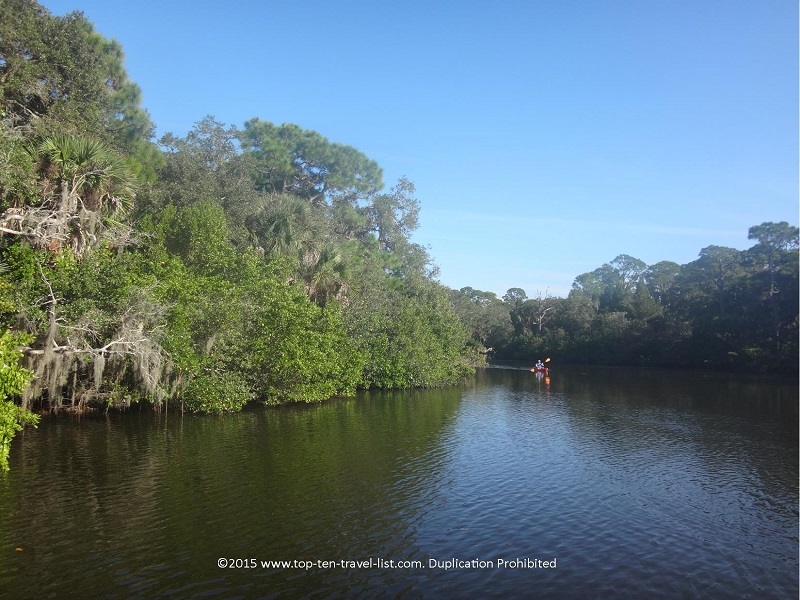 Along the way you will see many birds, beautiful mangroves and cabbage palms, and possibly a gator or 2. 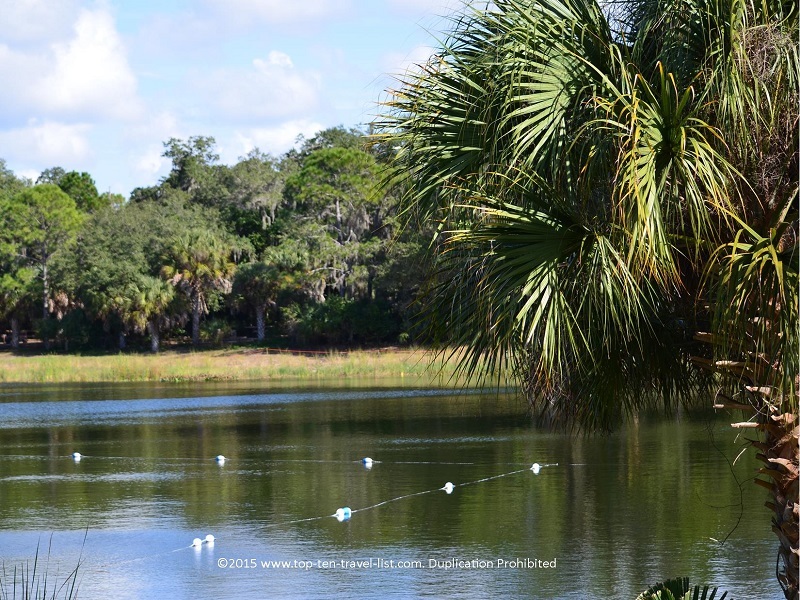 The highlight here is the beautiful Lake Osprey, which is open for swimming and fishing. 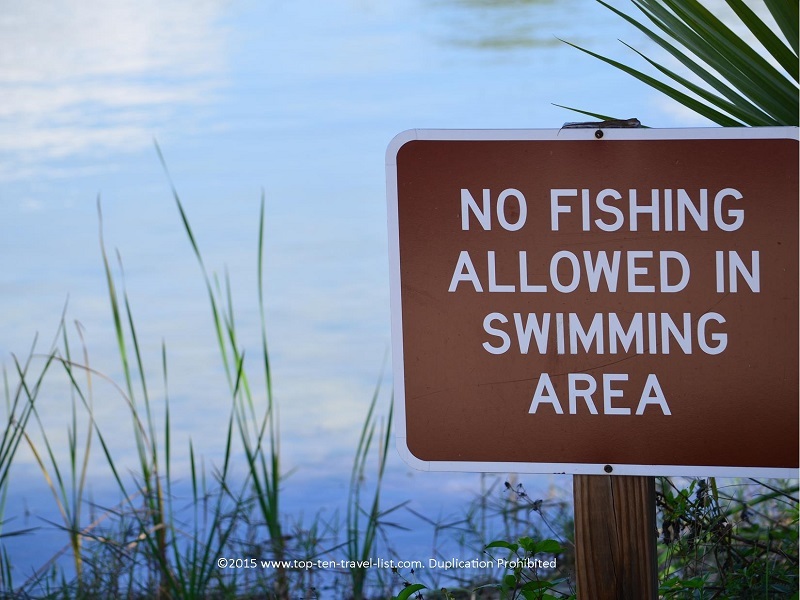 You’ll need to make sure only to swim in designated areas as alligators frequent the area. There is a small nature trail which winds around the lake. This is the perfect spot for some great photography. Be sure to take the short trail around Lake Osprey for the fantastic views! A view of the small beach and swimming area. 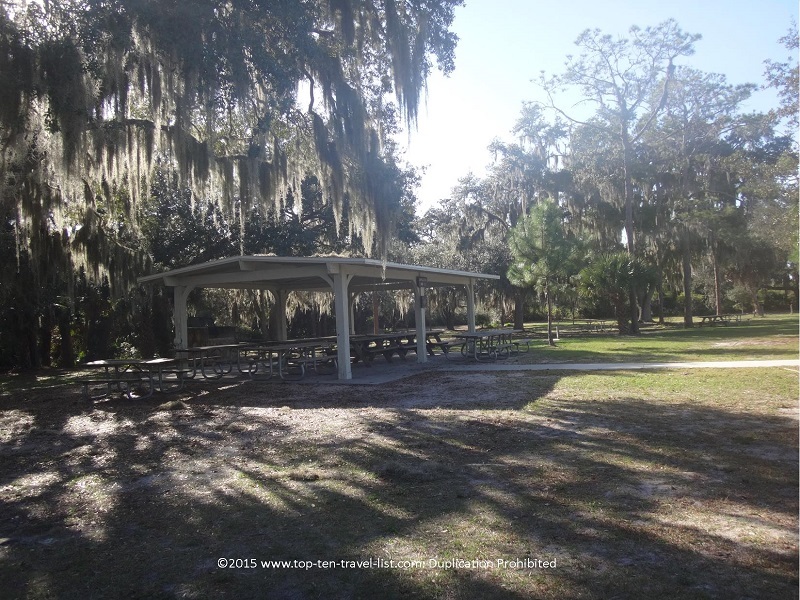 There are plenty of picnic tables scattered around the park, so skip the overpriced restaurants and enjoy a full day out in nature. Who needs to go out to a restaurant when you have a natural setting like this? Take a break from overcrowded, pricey tourist attractions and enjoy some of the Real Florida. 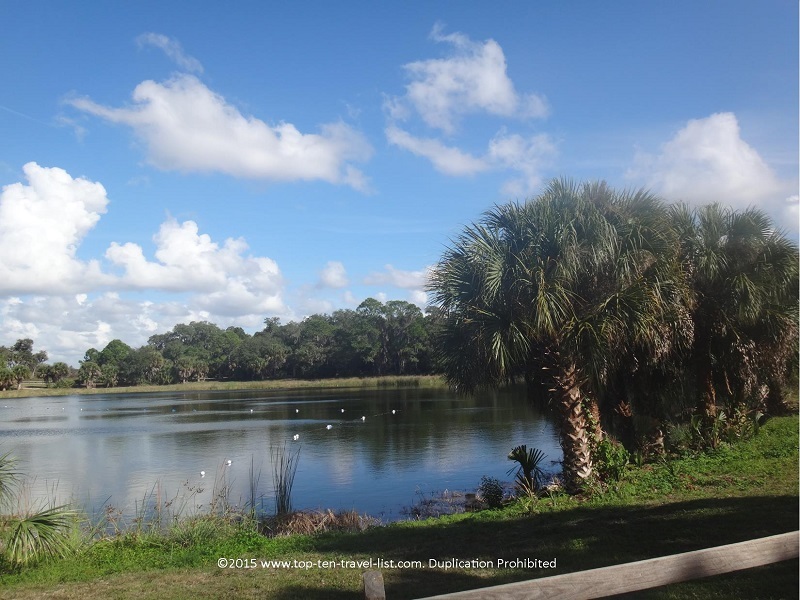 Grab your hiking shoes, pack a picnic, and enjoy a quiet day enjoying the easy trails and plentiful photo opportunities available at this beautiful Florida Park. *Bring with plenty of water, especially on hot, humid days. *Visit early in the morning for fewer crowds and better wildlife photos. *Bring with a camera. There are plenty of places to take great photos. *Wear sunscreen. Not all of the trails are shaded. *Wear gym shoes or hiking shoes. It will easier to walk the trails with the proper footwear. *Pack a picnic lunch and enjoy the nice outdoor setting. 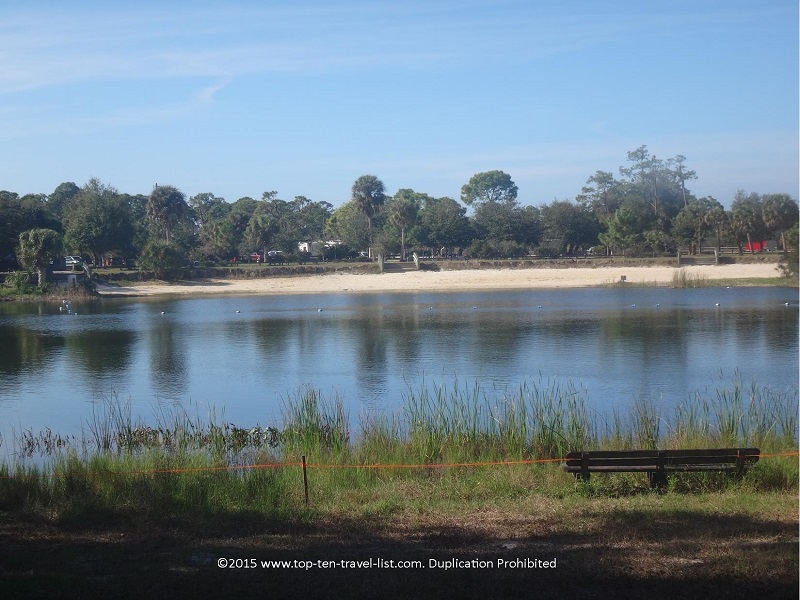 The park is located at: 1843 South Tamiami Trail, Osprey, FL 34229. Admission is $5 per vehicle. 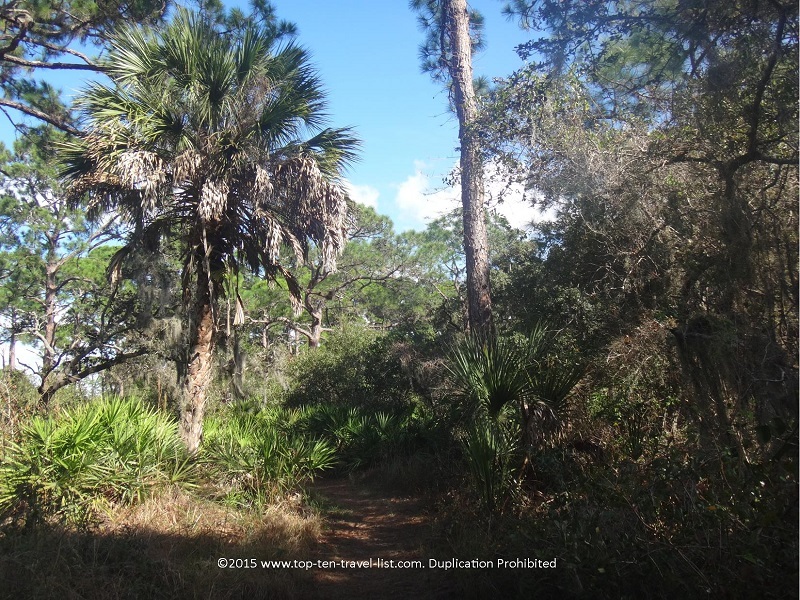 Visit the Florida State Park website for more details and a trail map. 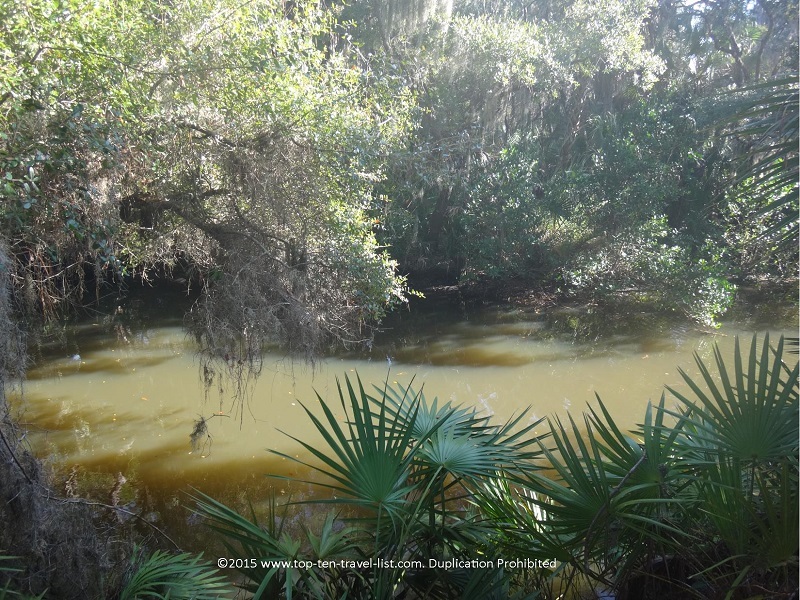 Have you ever visited Oscar Scherer State Park? 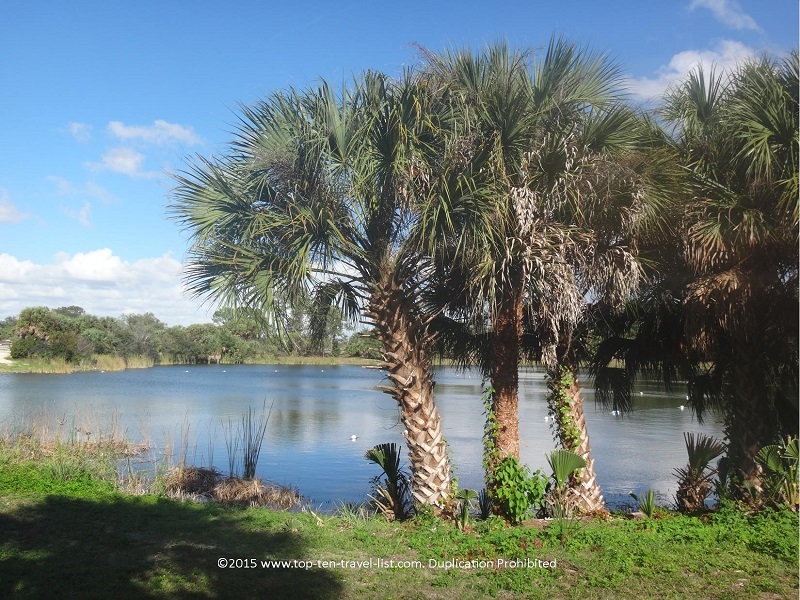 What are some of your other favorite parks in the Sarasota area?